Villa Golf is a dramatic four bedroom villa located within the Terravista Golf Resort Complex. The home was designed by renowned architects David Bastos and Adriano Mascarenhas. It includes two large decks, an infinity swimming pool overlooking the golf course, social area with entertainment center and pool and ping pong tables, designer kitchen, pond with waterfall and four bedroom suites that include an upstairs master suite with study, and dramatic master bath. The home has three bar areas including a sunken pool bar and a deck bar and barbeque overlooking the 18th tee and fairway. During 2006 and 2007 this villa received several special recognitions. Former US Vice President and Nobel Peace Prize winner Al Gore and his wife Tipper vacationed here. In 2006 the villa received a first place award for the best residential lighting design in Brazil. It appeared in two travel TV programs including the Discovery Channel which was covering the top golf courses of Latin America. It has also been featured in several Portuguese and Brazilian magazines including BRAZIL and CASA. The Terravista course is considered the #1 course in Latin America. It is set on the cliffs with some of the most spectacular beach and ocean views in the world. Guests can access the beach via a staircase that descends to the sea. There you will find miles of beautiful golden sand beaches. Golf Digest nominated the Terravista course as one of the 8 Pebble Beaches of the World. The Terravista complex also offers a Heliport and 1500 meter jet runway for private jets. Villas de Trancoso, a private villa retreat located on one of the most beautiful and private beaches in Brazil: the Nativos Beach. The villas are two kilometers down the beach from the Terravista Golf Resort Complex, much of which runs along the ocean, and is considered by many the best golf course in Latin America. On the beach is a beach bar, showers and a health and fitness center fashioned entirely of wood. The area is shaded throughout by palm trees. Central to the property is a cabana and white marble pool. The cabana contains a restaurant and an upstairs entertainment center with TV, DVD, computer and music system. The gardens have been carefully landscaped and lighted to create a magical environment both day and night. Within the garden complex are five luxury villas: 1 - VIP Villa (sleeps 2), a dramatic two story structure that includes a downstairs veranda, private dinning area, bar and entertainment center. Upstairs is the master suite with king-size bed, Jaucuzzi tub, reading area and veranda overlooking pool, gardens and beach. A central atrium rises to a glass skylight on the second level. 2 - one bedroom villas, spacious with verandas, hammocks and chairs plus large and comfortable master bathrooms. Both are set amongst our beautiful gardens. 2 - two bedroom villas, with verandas, hammocks and chairs plus a social area for TV viewing and gatherings. Each features a master bathroom with dressing area and double showers as well as a second bath with shower. Each bedroom can be configured for single or queen-size beds under spacious mosquitero netting. All villas are elegantly appointed and include beds draped in white netting, split air conditioning, wireless internet, cable TV, DVD, refrigerators, hair dryers and veranda with hammock and chairs. All are fashioned from the finest woods in Brazil. Lagoa Pearl and Barra Nova Pearl Eco-Nature Resorts are found in the beautiful area of Bahia, between Ilhéus and Itacaré. With 2.5 million m² of lush, tropical landscape and situated on some of Brazil’s most spectacular beachfront property with natural lagoons, mature palms and a private island, these eco-nature resorts will offer owners a luxurious living and vacation experience. Meticulously planned as sustainable projects, set as private developments of villas and apartments, this development will provide high-quality facilities such as a boutique hotel, shops, medical centre, restaurants, sports facilities and golf, health, and beach clubs. The interiors of all apartments have been designed to take full advantage of the natural sunlight. All apartments have access to a communal solarium, gardens and swimming pools. We have options from 46m² studio apartments up to 115m² three-bedroom apartments. Pre-allocation prices start at 67,500 UK Pounds. Lagoa Pearl and Barra Nova Pearl Eco-Nature Resorts are situated in between Ilhéus and Itacaré, one of the most beautiful sections of the Bahian coast. With 2.5 million m² of lush, tropical landscape and situated on Brazil’s most spectacular, beachfront property with natural lagoons, palm trees and a private island, these eco-nature resorts will offer owners a luxurious living and vacation experience. The meticulously planned and sustainable projects, set as private developments of villas and apartments, will provide high-quality facilities such as a boutique hotel, shops, medical centre, restaurants, sports facilities and golf, health, and beach clubs. The interior of all houses has been designed to take full advantage of the natural sunlight. A great opportunity for you to own a 173 m² private villa with pool - pre-allocation prices are starting at 67,500 UK Pounds. The Fazenda São Victor (São Victor Farm) is located in the promising region of Petrolina/Juazeiro, 560km from Salvador, strategically located between two of the more prosperous states of the northeast of Brazil, an area favored by an excellent agricultural climate. The type of soil is Podzolic Red/Yellow of good fertility, the terrain has a plain topography, with a good water source from the São Francisco River. It is supplied with electricity and an irrigation system. The farm encompasses an area of approximately 90 hectares, currently producing grapes both with and without seeds, and mangoes. Crop production is year round, including the period between the harvests of the major world producers and exporters, thus ensuring participation in both national and international markets. The farm is currently produces the apirênica grapes of the Festival, Thompson, Italy, Benitaka and Brazil varieties, and Tommy Atkins and Hadden mangoes. The infrastructure includes over 1600m² of built area, including a packing house, loading area, water reservoirs, office, storehouses, dwelling house, field WCs, etc. Currently at full production with agricultural equipment and machines, tractors and trucks, and 60 employees. Located on an island just offshore from the town of Canavieiras on Bahia’s Southern coast, this Amazing custom-designed beachfront house was built in 2006 with a spectacular cathedral ceiling, 4 bedrooms each with en suite bathroom, living and dining rooms, a professionally-designed kitchen, and sweeping verandas overlooking the pool and the beach. The main house has 699 m2 (7525 sq. ft.) of living area including two large studios. The property, bounded by a river to the west and the ocean to the east, is 10692 m2 (over 2 ½ acres) and has over 100 coconut trees. In addition to the main house, there is a separate caretaker’s house, a spacious workshop building, and a swimming pool and cabana. The property has an extensive outdoor lighting system and an underground irrigation system for the property's lawn and gardens. All appliances are included in the sales price, as are the light fixtures, ceiling fans and window shades, but the furniture is negotiable (most of it was imported from the USA). Designed and constructed by a Swiss engineer, this amazing property has 2700 m2 of land and 750 m2 of constructed area divided between 3 fully furnished houses: the main house, the guest house and the caretaker´s cottage. The main house has 2 comfortable bedrooms (both with air conditioning) and a social bathroom upstairs - the suite has a bath tub and walk in closet. The large living room has an English piano (Knight) and leads out to a large veranda where you can enjoy the lovely breezes and a perfect view of the ocean, the swimming pool and tropical garden (full of coconut trees and tropical fruit trees). On the main floor there is a charming kitchen, office room, hobby workshop room, storage room, maid’s rooms with private bathroom, and a garage that fits up to 7 cars (4 covered). The main house may be expanded. An elevator was included in the original project, for example. The guest house has 2 ensuite bathrooms with air conditioning, living room with cable TV and stereo system, kitchen and a small laundry room. The caretaker´s cottage has one bedroom, living room and kitchen. The garden has a kiosk with a barbecue grill, fridge, social bathroom, and a sink plus a dog house for 2 dogs. The property has Cable TV, high speed Internet, and a internal telephone communication system. It is very well located just 250 m from the extra fine gold sand beach "Praia dos Milionàrios" (millionaire beach). The property is just 10 minutes drive from downtown Ilhéus and 5 minutes from the airport. 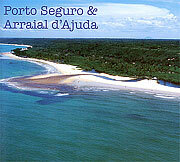 Located on the Peninsula de Maraú at the state of Bahia - one of the most beautiful beaches of Brazil. This amazing property is a small ecological paradise located at 200km South of Salvador, 120km north of Ilhéus and 70km north of Itacaré. The property features a botanical garden, more than 10.000 plants and trees, 200.000m2 of land, 50m of beach front, private lake, 2 hectares of native Mata Atlantica, and a 700m landing strip (ideal for private aircrafts). The property currently has 5 houses and features 360° panoramic views of the entire region – It is a great option for resorts or private condominiums. The land is divided into two parts, separated by a lagoon called the Lagoa do Cassange. The main part of the property for development is made up of 190.000 m2 and is where the houses are constructed. There are an additional 17.000 m2 between the lake and the seaside. Zoning allows for construction on 15% of the total area which would be about 30.000m2 for single floor units. It is also possible to construct up to 60.000m2 if constructing 2 floor units based on the 30.000m2 model, but with a maximum height of 7.5 meters. Zoning allows for an additional 20.000 m2 of constructed area for open spaces such as sport courts, swimming pools, etc... The property has electricity service and a well for fresh potable water. The exact size of the land is correct as the owner has recently measured it by certified GPS (general position system). New high class condominium on the tropical paradise island of Arraial d’Ajuda. The condominium has just 8 large lots, starting at 2000m2. The location is truly excellent on Falésias de Pitinga, between the beaches of Pitinga and Parracho. The charming centre of Arraial is a mere mile away. The house in the pictures serves as an example. Built in just 5 months, with a total building cost of R$ 154.000, including swimming pool, solar heated water etc. This low-cost and high quality construction is possible because we have all the contacts with local, english speaking architects and construction companies. Prices of the lots start at R$260.000, for a lot of 2000m2 (note that lots vary in size and view) and may be paid off over a 4-year installment plan. The lots have building licenses for construction and it is possible to construct on 30% of the land, 2 floors to a maximum height of 7 meters. In total, you can have your very own brand new luxury house in paradise within half a year for around R$400.000!!! Excellent opportunity to own an exclusive charming Pousada in one of Brazil’s most visited locations - Porto Seguro (740 km South from Salvador – Bahia). Located just 100m from the Taperapuan beach, the most valuable area of Porto Seguro, this unique beach style Pousada with 4.329 m² of total area and approximately 1.500m ² of built area offers 28 furnished apartments with air conditioning (14 of them with ceiling fan and A/C), fridge, 20 " TV, brand new mattress, private bathroom, with a total of 70 beds. There is also a restaurant and bar (also serving outside clients), industrial kitchen, living room, reception area, office (with computer), gourmet area, sauna, small shop (with 2 furnished office rooms that are now functioning as a travel agency), 250m² room for events (with sound booth, office, kitchen, toilets for people with special needs), chapel, home-theater room (equipped with DVD, 42 " TV, air conditioning, projector and WI-FI system), dressing room, visitors parking, 70.000 liters swimming pool, Jacuzzi, and 2.500 m ² of green area with palms and native trees of the Atlantic Rain Forest (Mata Atlantica). The deal also includes 2 independent furnished houses with 2 bedrooms, living room, kitchen, bathroom with solar heating, A/C and private area. O Segredo da Bahia – Discover this best kept secret located in the heart of Arraial D’Ajuda. With over 32.000m2 of dense tropical vegetation and a privileged sea view, filled with streams, lakes and local fauna. Come and be part of our magical paradise! Buildings with a maximum of two floors and plants to one, two three Dormitory. An excellent opportunity for investors, or the privileged to have your own private island in the famous beach destination Angra dos Reis – 150 km from Rio de Janeiro, 380km from São Paulo. Itanhangá is one of the most attractive islands in Angra, because of its location: Bahia da Ribeira, only 3000m from the continent, with neighbors like the Hotel do Frade, the exclusive Condominium Bracuhy and The Yacht Club of Santos. The island is 220.000m2 in size, and consists of two hills, approximately 100m high each, covered with “Mata Atlântica” vegetation. There are 70.000m2 available for development. There are eleven bungalows, a mezzanine with 160m2, bars, industrial kitchens, 400m2 party area built with bamboos, toilets, 2000m2 of beach, three generators and three “heli-ports”. The sales price is US$ 14,000,000. Here is your opportunity to own a luxury 3 bedroom apartment in the coveted condominium Alphaville! The building has it all, and then some: a bar, salon, gym, sauna, pool, tennis courts, soccer field, squash courts and visitor parking! Inside, this modern apartment comes equipped with central gas and hot water (a rarity in Salvador), sleek and tasteful cabinetry and a veranda. Also includes 3 spaces in the parking garage. A gem!